Arenal beach Javea is one of the best-known beaches of Javea. Arenal translates to sandy ground. Located right in the Bay of Jávea, it is the main beach and therefor very hard to miss. The fine sand here feels good between the toes while gently sloping down to the sea, providing people of all ages and disabilities excellent and easy access to the water. Oh and the water quality of this lovely site has been recognised as blue flag, so jump on in! The Javea Tourist information has an office on the Arenal and can supply you with ideas to make your holiday a great one! Its location is perfect for all year round living, Holidays, or visiting for short periods including the wintertime. This area is also well visited from the Spanish community especially from Spaniards who live in major cities like Madrid and Valencia; Arenal is a very popular location for them to own apartments and villas in this area, there is also a local supermarket called MasyMas located at the main car park of the Arenal. Javea Arenal Beach his is obviously the beach you want to be to enjoy all those fun in the sun beach games. People can be found lounging in sand, playing football, volleyball, building sand castles, etc. And owning a lively promenade it delivers bustling night markets with stalls, cafes, including the famous Cafe Wien, restaurants and nightlife. Siesta trip adviser can supply all types of water sport adventure, this company provide the necessary equipment to satisfy any appetite for fun and adrenaline. To top it off the views of Montgo, in the day are truly fantastic and in the summer months there is an exciting and wonderful fireworks show nightly. Clearly this beach has it all. 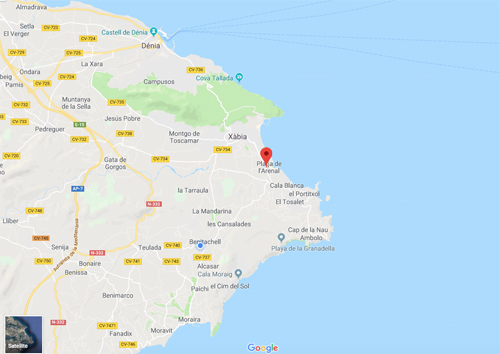 Its northern limit is the Parador Hotel Javea, which has one of the best views of the territory between the capes of San Antonio and Nao, with excellent tourist facilities.